- And then a very warm velcome to our special guest, His Majesty and our beloved KING KONG Olav! That aside, would it not be a better project, and a more realistic one, to buy home the Andrea/Harald Jarl. She is upgraded and in top shape, fully refurbished, and could go directly into Hurtigrutens cruise sailings without much alterations...? That would naturally be a much better alternative. She was in use until very lately and has hopefully been kept in a much better state. Kong Olav has almost not been in use since she was purchased from Norway in 1997, and has been neglected for many years with no maintenance and only temporary fixes when things broke (such as water leaks and so on). I firmly believe that if there is no market for Harald Jarl, if she can't find a new owner, it is very unlikely that Kong Olav will return to some kind of service. 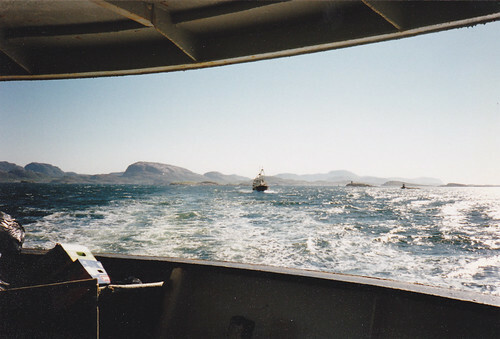 Kong Olav approaching Ålesund, October 1990. Regards, photo and copyright, Sigve. Last edited by Sigve; January 26th, 2010, 17:58. That is one of the best way I would like to remember her: in service along the Norwegian coast. Each time I see a picture of her, I find it strange that she did not survive the much older Nordstjernen in Hurtigruten service. 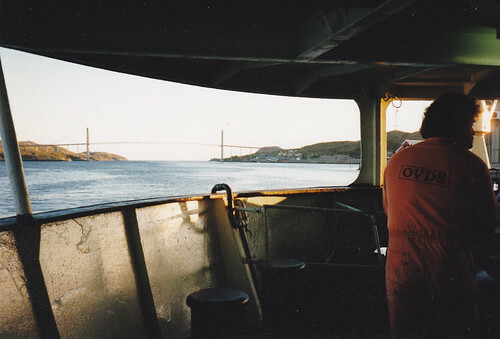 There are some really good photographs of a Hurtigruten trip on Kong Olav in 1990 on Flickr. Perhaps the photographer would share them here too? I've asked so we can see what happens. Last edited by Gaelsail; February 19th, 2010, 16:48. Great images in that album... I wonder if the member was on board at May 17th because I can see they had folk dance on the dock, and the ship is flying her decoration flags. isn't correct. The picture is taken in Ålesund! Hallo, CaptainsVoyage, from a newbie. First - many thanks to Sigve for correcting the caption to my photo of Kong Olav on Flickr. It was a real surprise when Gaelsail invited me to join you. I started the Flickr lark just to show friends my Aussie photos, but then began to dig out some of the older holiday snaps including the Hurtigruten ones. I also still have the daily schedules, the deck plans and map of the route which also gave the duration of each section between the ports. I told Gaelsail how it was impressed upon us at the start that the ship was a working vessel (that's why I went as cruise liners are not my thing) and if we were not back on board when she was ready to leave - tough! So at each port I plus a few other enthusiasts would be at our station if it were a brief stop, ready to belt down the gangway, have a quick look around, snap what we could, have a peek at the world beyond the quay and then scuttle back on board. It was just great. I got quite emotional seeing the Burma photos and reading the report about the Kong Olav and now, as a result of it all, that trip has come alive again. I'm checking my negatives, getting the album photos in better order to correspond with the journey and will post more on Flickr. Can I ask your help in ID-ing some of the places - and those bridges? I'll post the queries here. Long post, no apologies, just had to share my excitement with you. And Pakarang, I was on board on 17 May when the folk dancing took place, that places it at Stokmarketnes, I think, or else Sortland. Maybe, with someone's help, if I post before and after pics. we can pin it down. Welcome Wherrygirl. How lovely to hear about your voyage aboard Kong Olav. It wasn’t until much later that I was first able to travel on Hurtigruten, thus missing out on a generation of ships to my subsequent regret. Places may be easier for me, though they change too in some respects – Svolvær for example in just the last few years. But there are many here who love a challenge and will be able to answer your questions. Welcome on board wherrygirl, and thank you for sharing your memories from your coastal steamer trip. It's always interesting to read how passenegrs both experience our coast and how passengers experience the Hurtigruten working ship experience. Hopefully, you will find a lot of information and help here at CaptainsVoyage, and hopefully, we will be able to help you pin point different ports of your journey. Feel more than free to create your own thread anywhere in the forum, if you don't already find a thread by a suitable title. Many thanks for your warm welcome, Pakarang and Seagull. I'm scratching my head wondering where to start with my ID queries. Getting quite embarrassed at the list Will post soon. What a surprise - unexpected birthday greetings on my day. Having landed amongst a horde of Vikings (you must know the reputation they have in our English history books ) I chose a fearsome weapon for my avatar to brandish. But maybe I'll let down my guard - you're a great crowd. Many thanks. 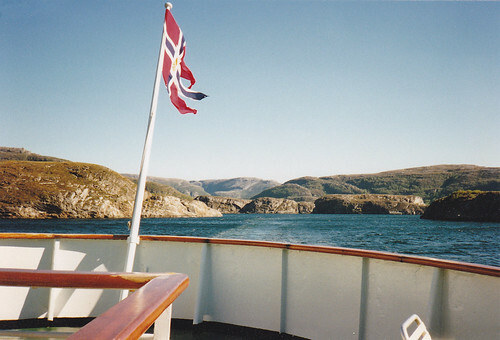 Having completed reorganising my Hurtigruten photo album I've been able to ID some of the places from photos on the Web. But I still need your help. The following 3 pics. are between Trondheim and Rørvik. I'm almost sure the first is the bridge as we drew towards Rørvik, but what of the other 2? Difficult, I know, but someone may recognise the mountains! Next time I have what is probably a sister ship on its way south, perhaps you can ID her for me. Last edited by wherrygirl; March 8th, 2010, 19:47. Reason: I messed it up and forgot to click the Insert Image icon. Probable have to repeat it all. The first one looks like a narrow sound just north of Rørvik. The last one, is definitely my former home town of Rørvik with Nærøysundet Bridge in the background!.